Alibaba - many people like to trade this counter, but from what I know, not many is making money out of it because the stock price is down most of the time. Using our ART position trade system. 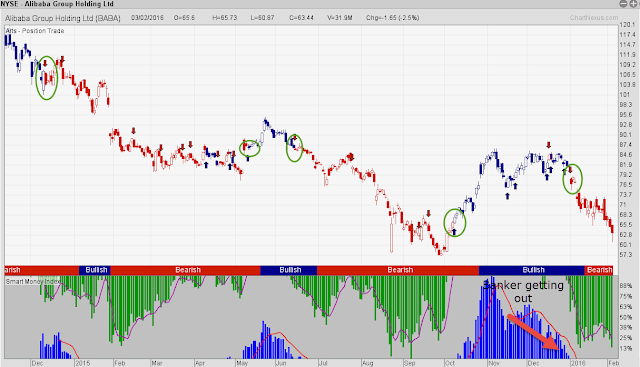 We can tell when to get in and when to get out following the Blue and Red candlestick(Thats the strategy). Following the blue, the Trend following system tell you it is difficult to Long, however if you are looking at the RED candlestick, seems like it is more profitable to Short. If you want me or my team to check out other stock for you - FREE. Drop me a message with you stocks and email. We will let you see what the system says about your stock.